Lauren Smith is a professional artist living and working in Ulm, Montana. 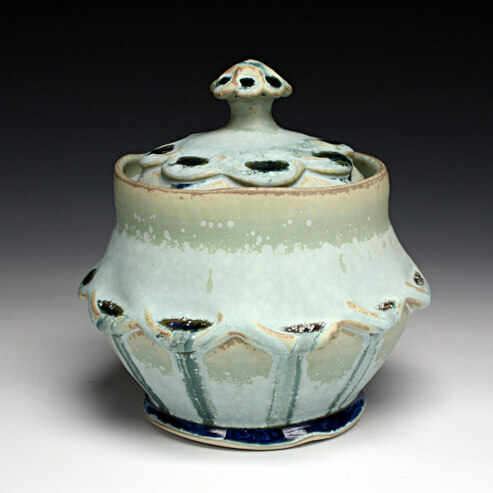 Smith received her MFA with an emphasis in Ceramics in 2011 and her BFA in 2005 from the University of North Texas. She studied with Steven Hill who is a renowned artist known for his spraying techniques. Smith has been a resident at Center Street Clay, the Red Lodge Clay Center and the Archie Bray Foundation. Smith has taught classes at the American Museum of Ceramic Arts, Ceramic Services, Paris Gibson Square Museum of Art and the Archie Bray Foundation. Her work is found in galleries all over the United States. I love making functional pottery. I want to share my work and create daily rituals amongst my collectors and admirers. I am constantly fulfilled every day that I can turn a ball of clay into something that someone can treasure. As I work at my wheel, I imagine my pots being used whether at a fancy dinner party with cake stands and flower vases decorating the table; or perhaps a favorite mug being filled with hot, steaming coffee or warm tea. I use porcelain clay that is malleable and soft; it responds to the lightest of touch and can be altered until dried, then fired to create a hard permanent object. My forms are wheel thrown, trimmed, and manipulated. I apply a scalloped ruffle around each piece which creates an area for glaze to pool, resulting in variation and breaking up surface. I use a glaze pallet consisting of blues, greens, oranges and browns that are bright enough to attract attention, yet subtle enough to harmonize with the food presented on them or the flowers contained in them. I use a small, surgical knife to draw lines which begin at the space between the scallops and go vertically up and down the piece. The glaze breaks around these lines usually resulting in a lovely separation breaking up the surface. I spray and layer three to four glazes on each piece and fire in a gas kiln to cone nine in an oxidation atmosphere. My inspiration comes from nature, specifically flowers and the way their petals unfold. I always have a camera with me in case I see an interesting flower or beautiful bird. I look at antique pottery, glassware and other current potter’s work to inspire and energize my own work. I am so lucky to be able to wake up every morning and do what I love to do. I have always been a maker and I will always be one.